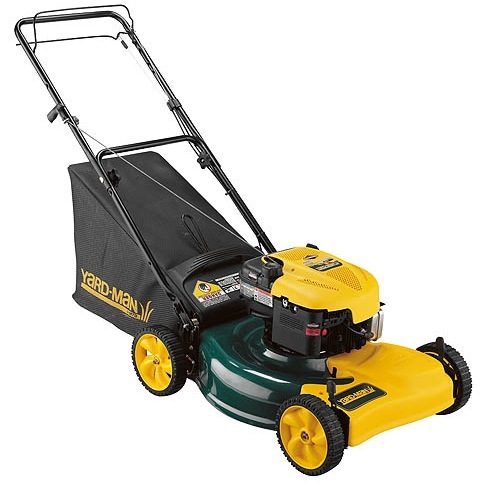 The Yard-Man mower model 12A-446M001 is equipped with a side valve 4 stroke Briggs and Stratton engine. This is a proven engine design that has been around for decades. A standard pull rope starter puts this mower into action. The deck allows for rear bag or mulching the grass clippings. A single speed front wheel drive self propel comes standard. Yard-Man model 12AE-46JA001 comes equipped with an overhead valve (OHV) 4 cycle engine that carries the MTD brand name. This engine delivers more horsepower than the side valve Briggs and Stratton engine featured on the less expensive model. Single speed front wheel drive keeps this mower moving when the rear bag fills with grass. An electric starter helps offset the fact this mower does not have a blade clutch option, which required more frequent engine starts. The deck is 3 in 1 design, which allows for side discharge, rear bagging, or mulching of the grass clippings.